Perhaps the best development in the Valley during recent years has been a certain kind of growth. It has nothing to do with population or plants but rather a veritable boom in barbecue eateries. For years and years here in the Valley, The Longhorn was the lone source of barbeque-generated smoke, the sweetest form of pollution man has ever produced. Currently that lonely bellwether of barbeques has three competitors stoking their pits across the Valley. It is a competition I highly encourage and strongly support to the point of borderline gluttony. Like the meat on the barbecue, I am a pig. I’m just glad to be a porker on the food chain a link or two above my distant relatives that I so lovingly devour. Being an admitted slave to desire, I must show the utmost respect to the barbecue masters and so I will list them in chronological order as is only fair. Starting with the youngest, Porky G’s fired up their smoker here in the Valley a few months back. Located on Sprague in front of Fred Meyer’s, the new kid on the block hails from Couer D Alene where it opened its first place in 1995. I was impatiently knocking on the door a minute before they opened that first day here. My impatience was soon rewarded as I dug into their baby back ribs. All the drooling I had been doing as I had driven by during the remodel was wiped away as I prepared my chin to be covered in another warm, thick and much tastier liquid, barbecue sauce. Since that blast of God’s bounty was opened to the Valley, I have been back a time or two to draw from the well. I particularly like the pulled pork sandwich and the ribs. Beyond those iron-clad recommendations, I would also offer my services to stand on the sidewalk and enthusiastically wave folks in to try their vast array of sides. They have a ton of superb sides, or maybe super”a” sides is more accurate. From the smokey bacon au gratin potatoes to the seasoned green beans with bacon, every side I tried was a hit. At the risk of sounding partial, I must say that when it comes to Porky G’s, you have to take sides. From Porky G’s we take a short hop down the timeline to Charlie P’s, which has been open almost two years at Sprague and Vista. The P-man, like the G-man, knows his Q. Since the first time I laid eyes on his menu to this day after trying everything on the menu that looked like my kind of thing, I have been a rabid fan. I have written at least two blog posts about his menu and have more in mind. Because barbecue is my favorite that has been my focus, but seafood is a close second and I haven’t said a word about their amazing seafood fet or seafood calizone let their nose-, eyes- and mouth-wateringly good seafood omelet. Then there is the pizza and broasted chicken to tell the world about. Maybe I would carry on more about his food if I weren’t so busy carrying it out and putting it where it belongs which is in my belly. The only problem with Charlie P’s ribs is that they scream out at me every time I open the menu, drowning out all the other worthy choices. Heck, those ribs are so obnoxiously good I can often hear them screaming at me from my house three miles away. 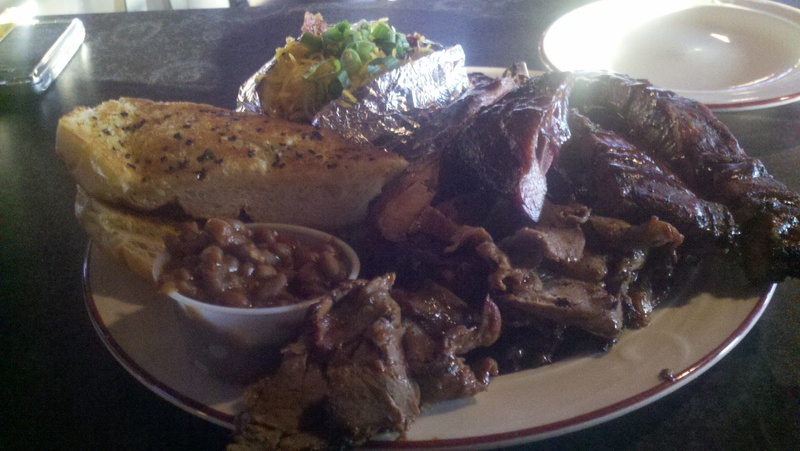 My recommendation for Charlie P’s is their Smokehouse BBQ Combo for $16.95. It is perfect for Elaine and I to share because I am able to hog the pork ribs, give her the chicken and fight for a fair split on the fantastic sirloin roast. Next in the birth order of our blessed brotherhood of barbeques is O’Doherty’s on Sprague between Bowdish and Pines. 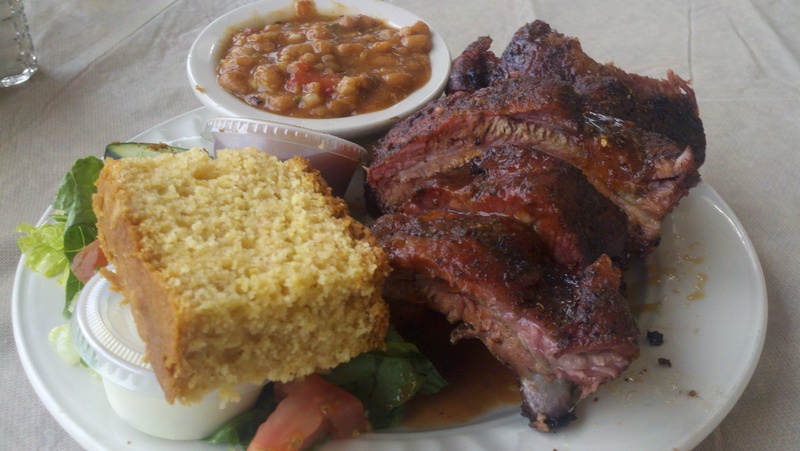 Savory smoke has been seeping past racks of meat that it richly flavors on its way out the smokestack and up into the Valley sky since the late 90’s when Smokey’s was there. O’Doherty’s moved there in 2002 and have been serving solid servings after solid servings ever since. It is the kind of place that when you look back you realize that everything you have ever eaten there was good. The other night I was there researching this story and refreshing my fond memories on a half rack of ribs with Elaine. She ordered a salmon sandwich that we had not seen there before. 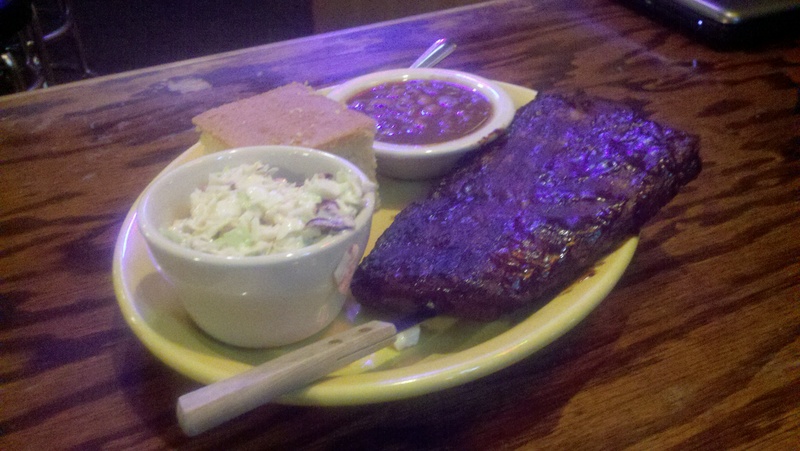 It was so good, it almost made me wish I had ordered it instead of the ribs. Luckily, it was several bites over Elaine-size and so I enjoyed a rib/salmon combo that went straight into the old stomach’s scrapbook of memorable meals. You might call their food “good mood food”. Whatever mood your are in, order the food that fits it and you’re good. The oldest of the barbecue boys by far is the Longhorn on Argonne. Today is Father’s Day and like every Father’s Day, the Longhorn will be packed with fathers who were given their one day of the year to choose where to eat. There will be a long line all day leading up to heaven where the world’s best barbeque buffet has been laid out. If the Longhorn had been around in biblical times, this would have been the disciples vote for the last supper. There is one clear choice for me as far as recommendations go for the Longhorn. When we were first married 29 years ago, back before the kids came along and decided where the family was eating out, back when the Longhorn was a drive-in, we ate there at least half the time since it was always my choice. We ate there occasionally on Elaine’s turn as well because she loved their bbq beef sandwich almost as much as I loved the bbq ham and swiss. In those wonderful years when calories were of little concern, The Longhorn Special featuring a sandwich and two sides was our favorite. While much has changed in, on and around us since those days, the Longhorn bbq sandwich remains the same, standing like an oak on Argonne where all the fast food chains have grown up around it like spindly scrub brush, trucking in every wimpy sandwich and burger their food labratories can concoct. There is nothing fast about the meats cooked at the Longhorn or O’Doherty’s or Charlie P’s or Porky G’s. These boys have the slow-smoked-meat market all sowed up and there’s no need for a big bbq chain like the Texas Roadhouse moving in to these parts. Their scouts probably looked at the Valley Mall where they would have been right at home competing with other chains like Boston’s and Outback. That probably looked enticing until they nosed around the Valley a bit and got a whiff of the local competition. The Valley, they wisely surmised, is already covered barbeque-wise and so off they went to Couer D’ Alene with their plans of expansion rolled up under their arm and their tails tucked between their legs. 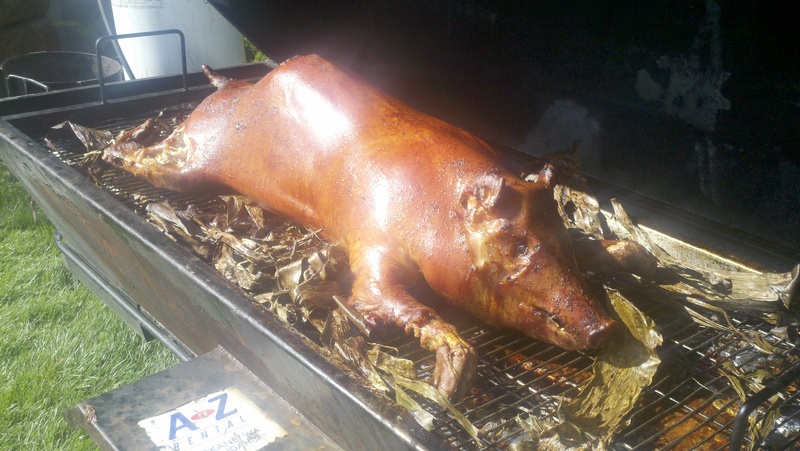 I caught this tired looking fellow out at True Legends annual Luau/ Pig Roast last Saturday. Everybody had a great time except maybe this guy. 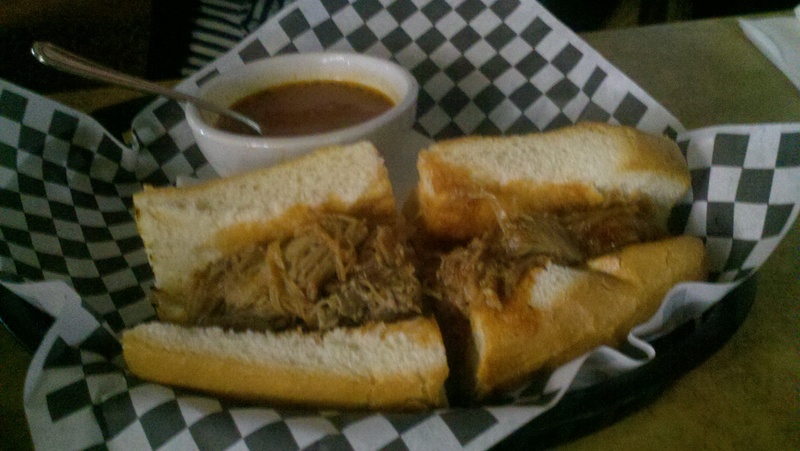 This is one of Porky G’s strong selections, the Pulled Pork sandwich. Porky G’s ribs aren’t bad either. This is Charlie P’s combo plate. It takes a combo of two or three people to get it ate up. 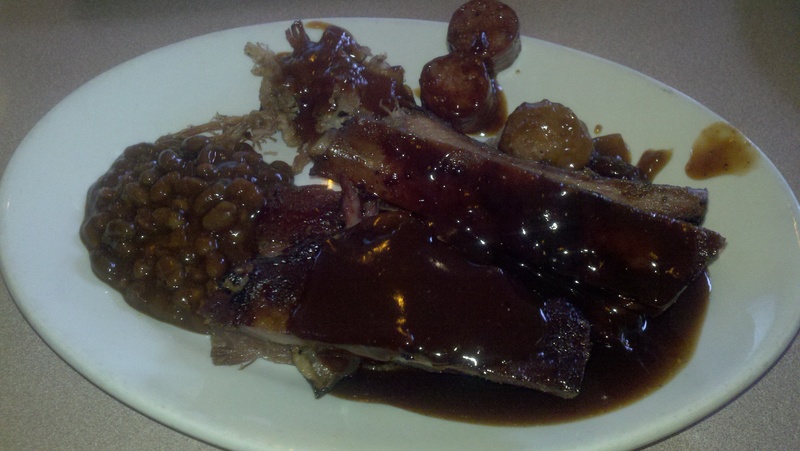 O’Doherty’s ribs are a work of art tastefully framed with sides of ecstacy. Their corn bread is perfection. After a round at their unbelievable salad bar, it’s time for the meat plate. This is one time I don’t mind things kind of running together on the plate. If you made it all the way to the bottom of this blog post, then you certainly deserve a reward. This is it. 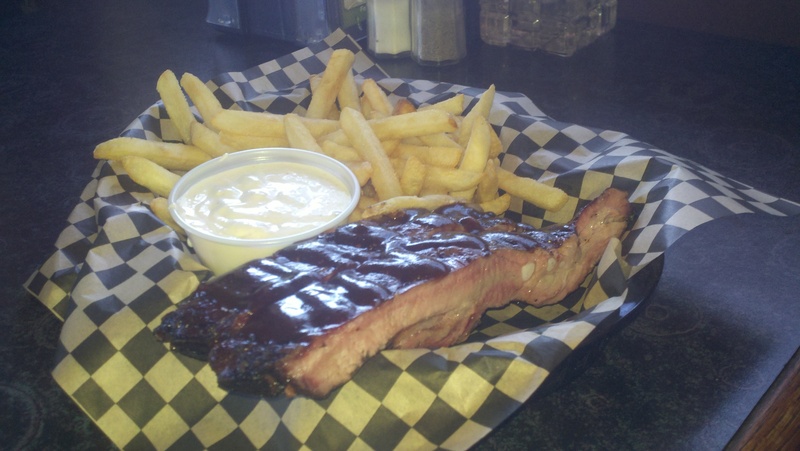 Between 3 and 6 Charlie P’s has a two ribs and fries for $5. It is the perfect little dinner.